Today's news is rife with reports of the death and destruction that our nation's opioid epidemic has left in its wake. Drug addiction has long made headlines as our nation has watched notable stars such as Prince, Philip Seymour Hoffman, and Whitney Houston fall prey to a lifestyle of substance use that once seemed foreign, intriguing, and out of reach. However, for millions of Americans, substance use is neither foreign, nor out of reach, and we're in a deadly tailspin. Every day 350 Americans die from addiction, 100 of those die from overdose, and large numbers are under the age of 25. One in 14 hospitals stays involve addiction and ABC's 20/20 recently reported that every 25 minutes, a baby in this country is born addicted to opioids. When we take into account the financial challenges of maintaining a chronic disease such as Substance Use Disorder, the economic costs of active addiction are considerable, and has been estimated to be $569 billion per year. In fact, the economic burden of addiction in the U.S. is twice that of any other disease affecting the brain (including Alzheimer's). Recidivism and repetitive treatment stays are a costly cycle for individuals treated for addiction and an increasing concern for behavioral healthcare providers and payers. As a point of reference, individuals who are prescribed medication for schizophrenia oftentimes stop taking medication because they have begun to feel better, and have convinced themselves they no longer need it. This leads to additional treatment, repeat hospitals stays, thousands of hours of provider time, and millions of healthcare dollars. The symptoms of addiction, because it is a brain disease, can manifest in a similar way through denial and behavioral health issues, which makes use events (e.g., returning to use drugs or alcohol one or more times),relapse, and repetitive treatment relatively common, particularly in the early stages of treatment. We reviewed our data in 2,281 patients who completed treatment for opioid use in 30 different addiction treatment facilities across the country. The data demonstrates that the majority of patients who are affected by the opioid epidemic are young males between the ages of 21 and 35. This data set consists of individuals who, upon completing treatment, participated in extended, post-recovery support delivered by professionals using telehealth. Promisingresults and empirical data demonstrate that when treating patients with a chronic illness, extending the care continuum beyond short-term or residential treatment has a significant impact on a patient's ability to maintain their health. For individuals treated for substance use, this equates to long-term recovery. In this sampling of data, patients who suffer from chronic pain are 1.6 times more likely to develop a dependence on opioids, opiates, and/or heroin. This substantiates the wide belief that many middle-aged individuals are overusing and abusing opioid prescriptions and clearly, this data reflects the propensity for dependence on these powerful medications. 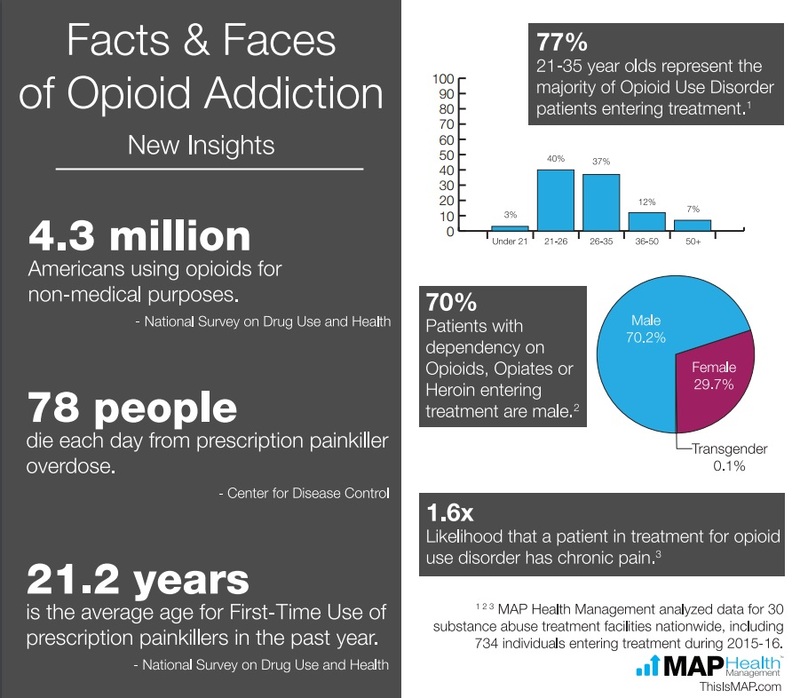 However, it is individuals between the ages of 21 and 35, which make up 77% of MAP's aggregate data set, who are identified as having a dependency on opioids, opiates, and/or heroin. Furthermore, 70% of all individuals represented in the cohort who are identified as being dependent on opioids, opiates, and/or heroin, are male. This is significant as it indicates that the epidemic is, essentially, effecting the future of our country. Young males who would otherwise be leading healthy, productive lives are not contributing to our society and communities, and get trapped in the criminal justice system. The data also indicates that this technologically savvy generation is open to embracing telehealth services to help maintain the recovery they worked hard to achieve. Based on widely accepted research, it is known that the risk of relapse decreases after 12 to 18 months of sustained recovery. Substance Use Disorder, like other chronic diseases, requires an extended, chronic care management model rather than an acute care model. Extending the care continuum for individuals treated for addiction may initially appear to be a costlier endeavor, however, in all actuality it is more cost-effective for providers and payers over time and leads to the successful sustainability of long-term recovery. Insurance payers are starting to agree with these preventative and chronic care models that improve long-term addiction treatment outcomes and have begun to implement pilot studies and reimbursement plans to extend the care continuum for this population. The strength of data-driven processes lead to the development of successful, sustainable solutions for providers, payers, and patients. Comprehensive behavioral health population management, predictive analytics, risk stratification, technology-enabled case management, and informed care direction, represent valuable resources for all those with a stake in improving treatment outcomes. Extending the care continuum for individuals following the completion of residential treatment significantly improves the likelihood of effectively managing the illness and maintaining long-term recovery. In one example, 82% of study participants who experienced a use event, completed the extended care program and were not using at the end of 15 months. This is a compelling indicator of the power of connectivity as these individuals learn to live balanced lives in recovery. For every person who maintains a connection during this tenuous time, the likelihood that they will maintain recovery increases which decreases recidivism and repeat visits to hospitals and addiction treatment facilities. Our experience with telehealth has proven to be overwhelmingly successful in the ability to maintain critical connections with individuals striving for long-term recovery. This data demonstrates that the provision of telehealth makes the transition from early recovery to long-term recovery as smooth and effective as possible during an otherwise vulnerable time – and is also cost-effective. Improving the outcomes of individuals struggling with addiction must be a goal of every healthcare provider. Hospital systems are under great scrutiny and challenged to be financially viable while maintaining patient safety, quality, and satisfaction. Combining an extended care continuum with technology leads to improved treatment and financial outcomes, and is refining the way in which addiction treatment is delivered. Jacob Levenson is the Founder and CEO of Austin-based MAP Health Management, LLC. MAP has established itself as the nation's leader in the provision of a comprehensive, accessible technology platform specifically developed to improve treatment outcomes for individuals treated for substance use, addictions, and other behavioral health illnesses. MAP's research analysts, clinical directors, recovery advocates, technology professionals, and billing experts are dedicated to improving outcomes, empowering treatment providers with data, reducing costs, and driving facility revenue. Levenson is a frequent contributor to leading addiction, healthcare IT, and population health management publications. For more information, visit www.ThisisMAP.com.